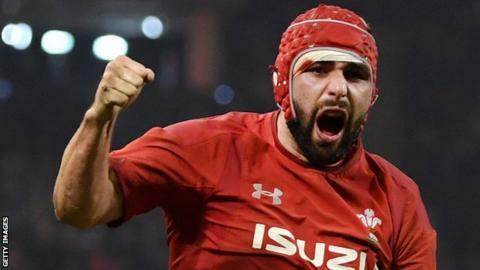 Wales lock Cory Hill will miss the remainder of the 2019 Six Nations Championship after injuring an ankle in the 21-13 win against England. The 27-year-old Dragons second row was hurt in the act of touching down for a vital second-half try which gave Wales the lead against Eddie Jones' team. "He's certainly going to be a loss, but any loss is someone else's opportunity," said coach Neil Jenkins. Adam Beard and Jake Ball have both started matches this season. Skills coach Jenkins added: "Cory was outstanding on Saturday, obviously with his try as well and he's a fantastic player for us. "He's a good person around the squad as well, [but] we've got some fantastic players in that position as well so it will be quite interesting to see who plays in the last few games." Hill packed down alongside skipper Alun Wyn Jones as Wales beat England to keep their hopes of a Grand Slam alive in head coach Warren Gatland's last season in charge. Beard and Ball started in the win against Italy after Jones and Beard were selected for the comeback victory over France in Paris. There's better injury news elsewhere for Wales, with full-back Leigh Halfpenny back in contention after playing a full game for Scarlets on Sunday after three months out following concussion. Fly-half Rhys Patchell and scrum-half Tomos Williams also look set to be available for the visit to Murrayfield along with tight-head prop Samson Lee.